Going up against a well-established app like 1Password is a tricky task, but BeLight Software attempts to do just that with Concealer, a new security solution for managing and protecting sensitive information. As a password manager it can't yet match its market-leading rival, but it has a very significant additional feature. 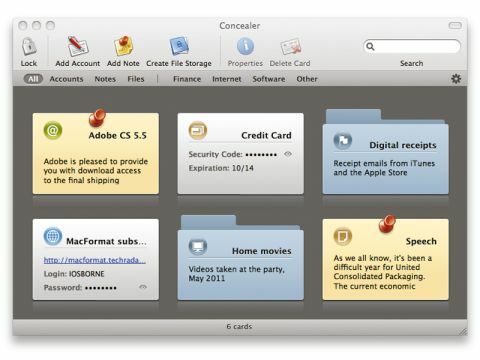 Concealer stores information such as passwords, bank or credit card details, software licence keys and website logins as cards and notes, pinned to a virtual notice board. Information is kept in a sparse bundle protected by AES-256 encryption. As its rival 1Password was first released in 2006 and is currently in its third version, it's unsurprising it has features Concealer's debut release lacks: browser plug-ins for 1Password save your account details as you surf, and let you launch a site and log in with one click. It also offers cloud synchronisation, and you can add attachments to secured items. But these attachments are the only way 1Password can manage files, and there's a 20MB limit. Concealer's File Storage cards can store any kind of data, with no restrictions on size. You can encrypt videos, music, photos, documents and even applications. They can be used just like Finder folders, but no one can get at their contents without your password. As a password manager, Concealer currently lacks the feature set of 1Password, but it's half the price and much better at dealing with data files. Over time, it could – and should – mature into something special.